Last night when a friend was over and said, "How sad that you just have one stocking hanging there all alone." You know what's funny? It had never occurred to me that that was sad. I guess I'm blissfully independant sometimes. I mean, how many stockings should a sinlge girl who lives alone have?one for my future husband? Future children? Surely that would be more pathetic! Now when I look at my lonely stocking it screams, "YOU'RE SINGLE! YOU ARE NOT MARRIED!" Incase any of you are worried about me and feeling sorry for me, thanks, but don't be! I'm really just being dramatic (shocker) I'm not in a deep depression about my single stocking. It was actually pretty funny that he pointed out how sad my lone stocking is! 394 - are you still reading these? 388 - did you really think I would list 400 things I love about blogging? 385 - how many of these do I have to fill in to make this list look long? 381 - giving shoutouts to fellow bloggers like Elaine, Sarah, Kristy and Teresa! 371 - am I really still doing this? 369 - how far can I go? 100 - here's to 400 more! 002 - and over 4 more years...wow, hard to believe that, what did we ever do before blogs? Ok, I'm a dork, hope you enjoyed that! Friday, Nov 27 - Sister gave me 2 seasons (9&10) of Friends, and mom got me a blinged out belt mainly for the Rodeo, but I've already worn it a few times! Wednesday, Dec 2 - Group of ladies that I eat lunch with every Wednesday from childcare at Tallowood took me to Taste of Texas! Sunday, Dec 6 - Friends (Rebs, Dave & Jess) took me to Roadhouse to celebrate early! A sweet friend in Preschool leadership gave me some yummy smelling bath stuff from B&BW! Monday, Dec 7 - actual b'day - when I got to the office my secretary had a gift of Ghirardelli chocolates on my desk! Then I went back to Taste of Texas with youth staff for lunch, got a Christmas plate from my boss and a super fun package from Rebs, complete with pj's, a movie, a magazine and popcorn! That night I had a Christmas party, where they surprised me with a yummy red velvet birthday cake! mmmm! I was also super blessed ALL DAY LONG with tons of phone calls, text messages and an overwhelming number of comments on facebook! So nice to feel loved! 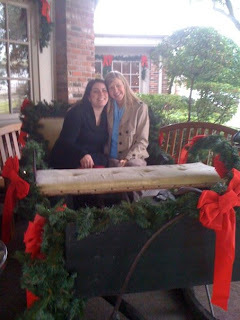 This pic is at Taste on my birthday with Rebecca, sitting in Santa's sleigh! Sorry the quality is stinky, it's taken with my iphone, hopefully after Christmas I'll have a new camera (hint hint MOM)! All in all I think I was sufficiently celebrated! I've decided to embrace the late twenties becuase, well, everyone says the big 3-0 isn't very fun. So I'm going to savor the 20s while I got 'em! So, here's to 27! Thursday night was the start of the craziness that is Christmas at Tallowood. Being on staff at a large church, December is jam packed with parties, ornament exchanges, lunches, special music concerts, the list goes on. Don't get me wrong, it's all really fun, just exhausting! So, last Thursday night was the Ministry Staff Christmas party. All the ministers & spouses gather together for dinner at one of the ministers' house. It was super yummy and fun! I love getting out of the walls of the church for a night to just hang out and enjoy eachother's company! Then, Friday morning I was up early to head down to Corpus. If you live in Texas, you may recall that the weather was horrific on Friday morning. I had heard it wasn't supposed to snow til after noon, so I thought I could beat it out of town. I got on the road a few mins before 8:00, feeling ok about the drive ahead of me. I had heard on the news that it was already snowing, but I thought if I could just get South of Houston, then I'd be home free....oh how wrong I was! It did stop snowing when I left the Houston area, but about 30 mins later the flurries returned. They got heavier and heavier. The grass on the median was covered, I was only going about 35-40 mph...ugh, slow going. I wasn't tooo concerned til my car read 32 degrees and the roads started getting slushy!!! Yikes! Yes, I was talking to the Lord through all of this. It took me 3 hours to get to Victoria, which it usually only takes 1.5 hours. Finally things let up and I got to Corpus some 5 hours later...no, I don't ever plan to drive through a small snow storm again! I spent Friday at a little Craft Bazaar at a lady's house, showing my sisters' necklaces. I also got to go see some of my favorite girls in a homeschool play. Then I met my parents for my favorite meal in CC! After dinner, my sister Kristy & her 3 kids had driven in, so we all met at the house. Saturday, we woke up and my mom made pancakes because that is mine & Ashlyn's fave and it was for both of our birthdays. We both got a few gifts and then my sister went back to the Bazaar, while my mom & I hung out with her kids! Man, I love those kids! I also went back to the Bazaar and got to hang out with some old friends. I was supposed to leave town late afternoon, but instead decided that I would just wake up early and drive back Sunday morning in time for church. Worst. decision. I've made in a looooong time! I ended up not going to bed til almost 1:00am, and couldn't fall asleep. The last time I remember looking at the clock was 2:30, when I had to get up at 4:30, that's right, I got 2 hours of sleep and then had to wake up and drive over 3 hours back to Houston. The drive back was almost as bad as the 5 hour drive there! I was so tired that I felt sick to my stomache...you know the feeling? I had to stop every hour just to wake myself up and move around, which is not my norm, I usually hate stopping, but this time it wasn't an option! I could barely keep my eyes open. I didn't get to take a nap til about 2pm that afternoon, and even after that nap, I woke up with a headache and was still sick feeling...ugh. I nursed myself on Sprite, crackers and soup. Thankfully after a good night's sleep I woke up on Monday, my birthday!!! feeling human again! Random thought/fact of the day: I only have Blake & Bradley left to shop for in my family!!!! Best shape I've ever been in for gifts for my family! Woohoo! That's right, I'm posting today, even though nablopomo is over! I am glad that I put out my Christmas decor - what little I have. I just have such a small apartment that I don't have a lot of tables or book shelves to put stuff on. So I'm limited to what all I can put out. I also had 2 fun finds one, an Amy Grant Greatest Christmas Hist CD that either someone gave me or I bought on sale last year. It was still in the shrink wrap! Perfect to listen to while decorting! The other fun find was some ornaments that I had gotten on sale after Christmas. I have an ornament exchange next week that I hadn't purchased an ornament for yet, so now I have a really great ornament that I'm excited to take to the exchange!